Harry Potter and the Deathly Hallows part 1 is the first part of the 7th and final chapter in the Harry Potter series. Last year’s Harry Potter and The Half-Blood Prince ended with a quest being set up, giving birth to a new trilogy of films in the Harry Potter series. 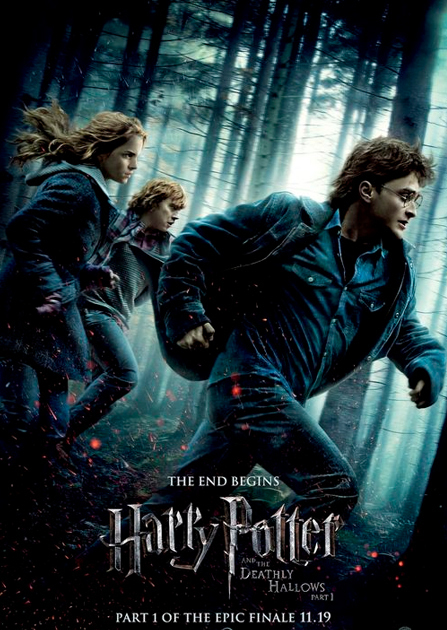 Whereas each previous part started with an introduction of a plot, a year in the life of Harry and his friends and then a quick resolution of the storylines mentioned at the movie’s / books beginning, The Half-Blood Prince positions Harry on the path to his ultimate showdown with He-Who-Must-Not-Be-Named. In other words, this is the start of the end and what we all have been dying to see for so long! The Half-Blood Prince went a way to take us off of the beaten track that has set up the Harry Potter series: we usually are introduced to Harry in his muggle home, again returning to Hogwarts to learn more about being a Wizard, his mysterious past and overcoming another obstacle, most usually Voldermort’s attempts to get his groove back, all in time to go home at year’s end. At the Half-Blood Prince’s end, all bets are off and Harry and friends decide not to go back to Hogwart’s but instead to go on a mission to find Voldermort’s magical devices and destroy them, giving them a chance at ultimately defeating him. This premise was enticing as it moved our heroes away from an environment that they, and we, have gotten comfortable with. Done with English private boarding schools metaphors and allegory, this movie chooses to showcase themes of maturity and being able to finally put theory into real-world practice: metaphors of the machinations of war during WWII brings up the atmosphere and tension of a thriller. However, in the execution, we get a road movie reminiscent of The Lord of the Rings: The Two Towers, complete with a shared object of evil power, worn around our characters’ necks that force them to turn on each other during their journey to destroy it. In relation to script, Alfred Hitchcock invented a script-writing term for an arbitrary object to kick his protagonists and antagonists into action: a MacGuffin. A MacGuffin was usually something that the antagonist needed to complete their evil scheme and one which the hero must then stop him from getting. The first Mission Impossible movie was criticized for having a too convoluted plot, where the 2nd was given a MacGuffin which was cheekily constantly explained throughout. The third film went further and referenced their MacGuffin in theory only, never revealing what it was to the audience! The movie admitted that it was only a plot device to what the audience really wanted to see anyway: action action action and Maggie Q. Harry Potter 7.1 however relies on no more than 7 Macguffins, with two previously being dispatched in HP6. The story is basically a treasure hunt for our young heroes whilst avoiding the attacks of their enemies. Another lazy script-writing technique is, when one is facing writer’s block and just cannot move their story along, they kill a character to send a shock-wave through the remaining character arc / storyline like the butterfly effect. This usually progresses the story through a myriad of new threads, setting up questions such as who killed the character and why? What sort of affect will this have on the characters and their situations and so on. JK Rowling has done this since Harry Potter 4, and doesn’t slow down. Admittedly, a big theme of the Harry Potter series is death, what with Harry’s parents being killed by an evil wizard who wants to kill he-who-lives. However when a minor character is reintroduced to a series just to be killed-off is cheap and reeks of bad television. That all being said, the acting and characterization in this film is great. The Hermione character hits her stride after leaving me cold in a few of the previous instalments. Emma Watson has now found a middle-ground between early adolescence and just being a brat. Harry is great as always and Ron gets a few good laughs as well. The relationship between our three heroes is well balanced out. Of note is a particularly poignant scene with Harry and Hermione dancing in the face of misery and death: not in a romantic moment at all, but just two very good, old friends being there for each other in a moment of crisis. The look of the film is fantastic. Whereas the earlier Christopher Columbus directed films have a classic, stage and CG feel, the introduction of Alfonso Cuarón in Prisoner of Azkaban gave the series an organic, natural feel: glows from wands where not overly dramatic but looked like moonlight, and Hogwart’s surrounds were rich and atmospheric. The Goblet of Fire added wands which fired off naturalistic, organic hot and cold lava which splurted and spilled plenty o’ magic about. David Yates joined the series in Order of the Phoenix and has kept these stylistic choices, whilst getting our characters out of their school and their uniforms, placing them in the cold, dark and mysterious UK woods, country-side and beaches. The action is great and intense, melding a lot more of the real world with its magical set pieces (such as a shoot-out in a London cafe) than any other of the instalments. This feels like a gritty Harry Potter movie that we can empathise with, away from the magic of Hogwarts and into our world. All in all, a very solid first part to a complete movie which fans of Harry Potter will lap up. Hopefully the mechanical set up will give way to a brilliant and satisfying conclusion to a film series that surprisingly still has a massive fan base. 4 out of 5 wands. If you had to click on any of the links in the plot section of this review, chances are you will have trouble keeping up with the goings-on in this particular episode as it references close to all previous adventures. A solid Potter knowledge is required and expected with this outing! See what Margaret and David have to say and check out the trailer!